What is the Estuary Blueprint? A “Horizontal Levee” is a re-imagining of how a levee looks and what it can do. Instead of a vertical wall to protect against storm surges, a horizontal levee uses vegetation on a gentle slope to break waves. The ecosystems that live on horizontal levees can thrive while helping to further process waste water from treatment plants. This project turned a degraded, diked bayland into an outdoor laboratory. Here, construction crews created two things: first, a two-acre wetland basin that can both remove nutrients from wastewater and provide extra wet weather storage capacity; and second, on one side of the basin, the experimental levee. Wastewater that has already undergone secondary treatment passes first across the surface of the basin and treatment wetland, and second through the levee and down into the sub-layers of 1.4 acres of the experimental habitat slope. The idea is that the combination of treatment wetlands and surface and sub-surface filtering processes, will support native plants and purify the water enough so that one day this kind of system can be directly connected to the edge of the Bay. Meanwhile, the new treatment wetland and basin is also designed to store up to eight million gallons of enhanced primary treated wastewater during a storm or peak flow event. Key water quality monitoring findings reveal several key components. First, the Oro Loma Horizontal Levee significantly removes wastewater-derived contaminants while providing valuable habitat. Some contaminants that were found to be removed were nitrogen, phosphate and pharmaceuticals. Second, contaminant removal was influenced by hydrology more than other design and operational parameters. Subsurface flow is the key! Finally, that nitrogen was removed by microbial processing within the horizontal levee design. The San Francisco Bay-Delta is named in the federal Clean Water Act as one of 28 “estuaries of national significance." For over 20 years, the San Francisco Estuary Partnership has worked together with local communities and federal and state agencies to improve the health of California’s most urbanized estuary. Nothing could be stranger than sitting in the dark with thousands of suits and heels, watching a parade of promises to decarbonize from companies and countries large and small, reeling from the beauties of big screen rainforests and indigenous necklaces, and getting all choked up. 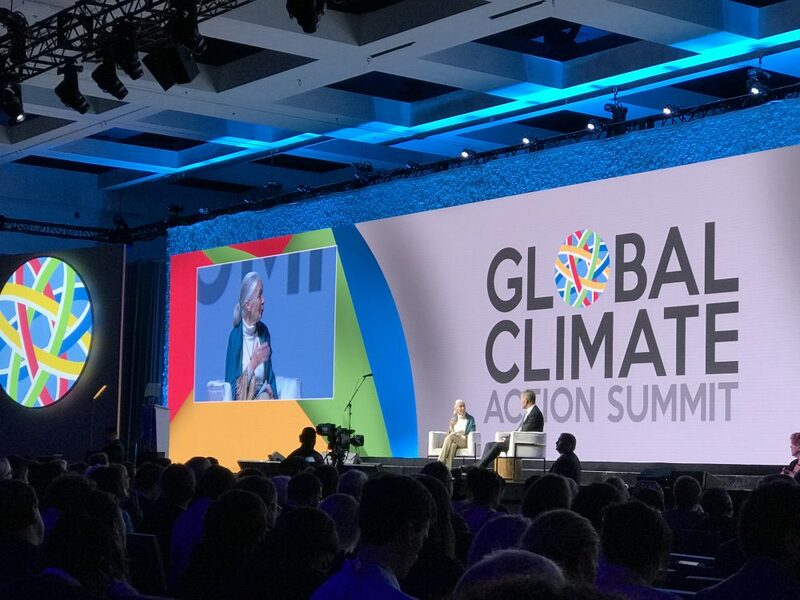 It was day two of the September 2018 Global Climate Action Summit in San Francisco when I felt it. At first I wondered if I was simply starstruck. Most of us labor away trying to fix one small corner of the planet or another without seeing the likes of Harrison Ford, Al Gore, Michael Bloomberg, Van Jones, Jerry Brown – or the ministers or mayors of dozens of cities and countries – in person, on stage and at times angry enough to spit. And between these luminaries a steady stream of CEOs, corporate sustainability officers, and pension fund managers promising percentages of renewables and profits in their portfolios dedicated to the climate cause by 2020-2050. I tried to give every speaker my full attention: the young man of Vuntut Gwichin heritage from the edge of the Yukon’s Arctic National Wildlife Refuge who pleaded with us not to enter his sacred lands with our drills and dependencies; all the women – swathed in bright patterns and head-scarfs – who kept punching their hearts. “My uncle in Uganda would take 129 years to emit the same amount of carbon as an American would in one year,” said Oxfam’s Winnie Byanyima. “Our janitors are shutting off the lights you leave on,” said Aida Cardenas, speaking about the frontline workers she trains, mostly immigrants, who are excited to be part of climate change solutions in their new country. The men on the stage, strutting about in feathers and pinstripes, spoke of hopes and dreams, money and power. “The notion that you can either do good or do well is a myth we have to collectively bust,” said New Jersey Governor Phil Murphy whose state is investing heavily in offshore wind farms. “Climate change isn’t just about risks, it’s about opportunities,” said Blackrock sustainable investment manager Brian Deese. But it wasn’t all these fine speeches that started the butterflies. Halfway through the second day of testimonials, it was a slight white-haired woman wrapped in an azure pashmina that pricked my tears. One minute she was on the silver screen with Alec Baldwin and the next she taking a seat on stage. She talked about trees. How trees can solve 30% of our carbon reduction problem. How we have to stop whacking them back in the Amazon and start planting them everywhere else. I couldn’t help thinking of Dr. Suess and his truffala trees. Jane Goodall, over 80, is as fierce as my Lorax. Or my daughter’s Avatar. Analyzing my take home feeling from the event I realized it wasn’t the usual fear – killer storms, tidal waves, no food for my kids to eat on a half-baked planet – nor a newfound sense of hope – I’ve always thought nature will get along just fine without us. What I felt was relief. People were actually doing something. Doing a lot. And there was so much more we could do. As we all pumped fists in the dark, as the presentations went on and on and on because so many people and businesses and countries wanted to STEP UP, I realized how swayed I had let myself be by the doomsday news mill. Since California’s last state-led climate change assessment in 2012, the Golden State has experienced a litany of natural disasters. This includes four years of severe drought from 2012 to 2016, an almost non-existent Sierra Nevada snowpack in 2014-2015 costing $2.1 billion in economic losses, widespread Bay Area flooding from winter 2017 storms, and extremely large and damaging wildfires culminating with this year’s Mendocino Complex fire achieving the dubious distinction of the largest in state history. California’s most recent climate assessment, released August 27th, predicts that for the state and the Bay Area, we can expect even more in the future. The California state government first began assessing climate impacts formally in 2006, due to an executive order by Governor Schwarzenegger. 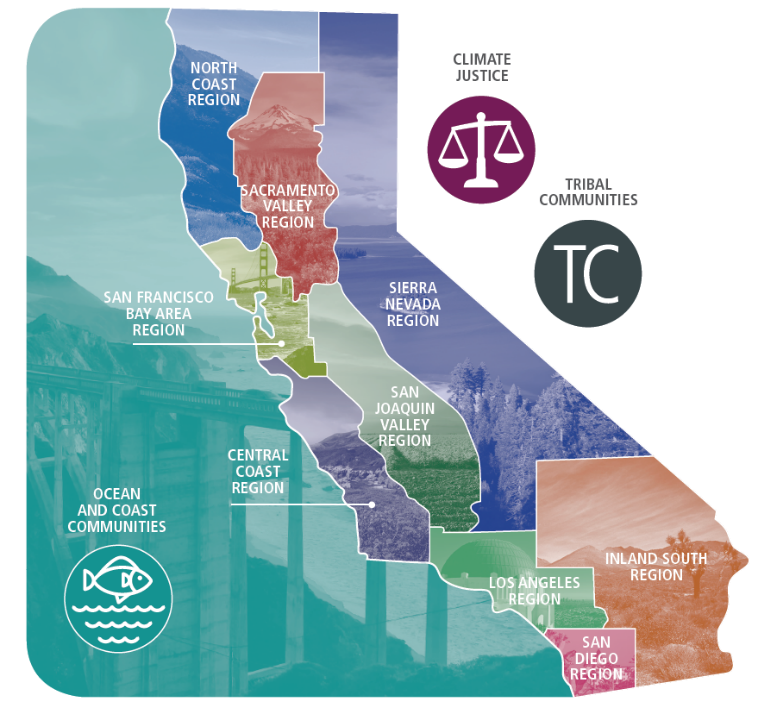 California’s latest iteration and its fourth overall, includes a dizzying array of 44 technical reports; three topical studies on climate justice, tribal and indigenous communities, and the coast and ocean; as well as nine region-specific analyses. The results are alarming for our state’s future: an estimated four to five feet of sea level rise and loss of one to two-thirds of Southern California beaches by 2100, a 50 percent increase in wildfires over 25,000 acres, stronger and longer heat waves, and infrastructure like airports, wastewater treatment plants, rail and roadways increasingly likely to suffer flooding. For the first time, California’s latest assessment dives into climate consequences on a regional level. Academics representing nine California regions spearheaded research and summarized the best available science on the variable heat, rain, flooding and extreme event consequences for their areas. For example, the highest local rate of sea level rise in the state is at the rapidly subsiding Humboldt Bay. In San Diego county, the most biodiverse in all of California, preserving its many fragile and endangered species is an urgent priority. Francesca Hopkins from UC Riverside found that the highest rate of childhood asthma in the state isn’t an urban smog-filled city but in the Imperial Valley, where toxic dust from Salton Sea disaster chokes communities – and will only become worse as higher temperatures and less water due to climate change dry and brittle the area. According to the Bay Area Regional Report, since 1950 the Bay Area has already increased in temperature by 1.7 degrees Fahrenheit and local sea level is eight inches higher than it was one hundred years ago. Future climate will render the Bay Area less suitable for our evergreen redwood and fir forests, and more favorable for tolerant chaparral shrub land. The region’s seven million people and $750 billion economy (almost one-third of California’s total) is predicted to be increasingly beset by more “boom and bust” irregular wet and very dry years, punctuated by increasingly intense and damaging storms. Unsurprisingly, according to the report the Bay Area’s intensifying housing and equity problems have a multiplier affect with climate change. As Bay Area housing spreads further north, south, and inland the result is higher transportation and energy needs for those with the fewest resources available to afford them; and acute disparity in climate vulnerability across Bay Area communities and populations. The assessment’s data is publicly available online at “Cal-adapt,” where Californians can explore projected impacts for their neighborhoods, towns, and regions.